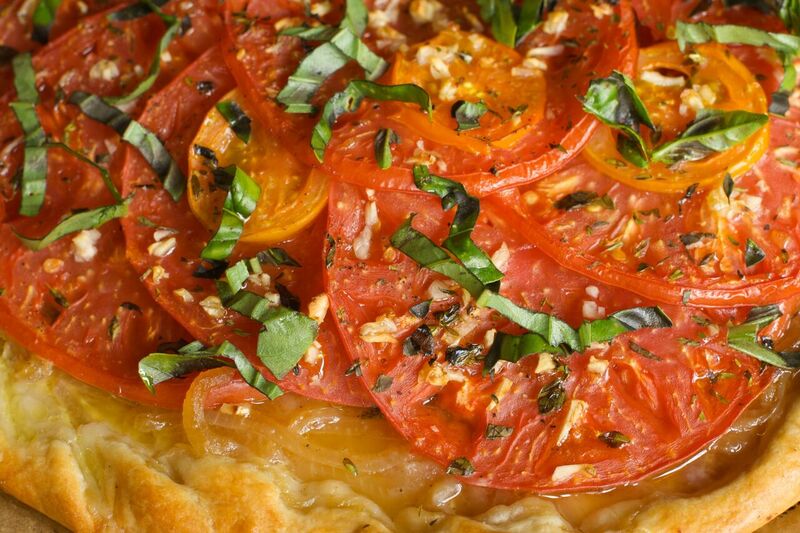 With pals like crispy phyllo and melty cheese, Heirloom tomatoes are the toast of the town in this easy and irresistible savory summer tart. Paired with a Mediterranean Salad, you have a fabulous stress-free brunch in no time flat. Prepare phyllo crust according to package directions using a greased 9″ x 13″ tart pan or rounded 10-inch ridged tart pan. Brush phyllo dough layers with melted butter as you carefully stack them in the tart pan. Set aside. Place Heirloom tomatoes in a large bowl or colander and season to taste with salt and pepper. Allow to sit while you prepare the creamy egg mixture. In a large bowl, beat eggs, shredded cheese and cream. Season with salt and ground white pepper. Pour creamy egg mixture into prepared phyllo crust tart pan. Carefully layer thinly sliced tomatoes atop creamy egg mixture. Top with chopped fresh herbs. Drizzle with Extra Virgin olive oil. Bake in oven for 30 to 40 minutes or until bubbly and golden brown.